Well, I’m an English author based in the UK. I write both adult and YA paranormal romance, urban fantasy and horror (pretty much any genre with a sharp dark edge to it) I’ve had a number of short stories included in various anthologies through the years, but have just had my first book, Bad Blood published through Evernight Teen. Bad Blood, Battle of the Undead #1 came out 5th September, so this is very much my blood-sucking baby to nurture at the moment. 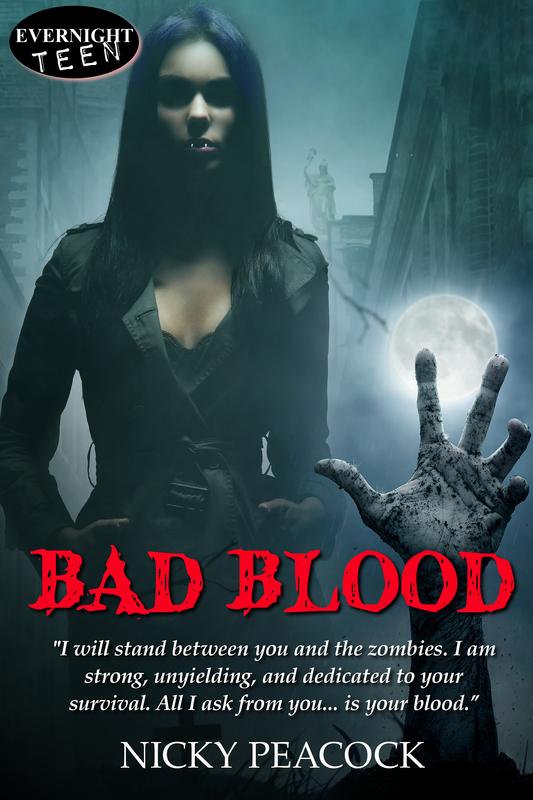 It’s a kind of Walking Dead meets True Blood for teens. It’s set in London and sees feuding vampires having to work together to save their food supply (the humans) from the undead uprising. It was a number of things really. I love both vampire and zombie books, but rarely found them pitied against one another in literature. I really wanted to read a story that threw both of these paranormal creatures into a story blender and see how smooth the end result was – so I wrote it myself. I’ve always been fascinated by the kind of ‘bad blood’ that can seem to develop amongst families, celebrities and even countries. I think it’s one of those things that, as an outsider looking in, you can’t understand how the resentment has escalated – but as one of the feudees (not a word, but sounds like it should be!) you feel totally justified in your anger and bitterness. So I set about creating a group of characters that would have to set their feuding aside for the greater good and work together – although even as the writer it was kind of hard to get them to play nice at times! 5. How do you deal with negative reviews? I live my life by a few simple rules and one of those is ‘you can’t please everyone all the time’ – you’d go mad trying, so it’s best to go your own way and hope that a few lovely people follow you down that road and help you on your journey. Bad reviews are a way of life for authors, and whether you’re a multi-million dollar selling one, or one like me whose just starting out – bad reviews will come, the trick is to remember that everyone has a right to their opinion. 7. Is there a message you’d like to get across through your story? I always try to include a theme in each story I write, usually it’s all down to the lessons that the protagonists learn through their journey and actions. I get a bit frustrated when I read a book (especially a YA one) where the main character starts out slap-able and ends even more slap-able! It just feels like their trials were for nothing, and you went along with them for no other reason than to be told a story. I like to leave readers invigorated at the end of a book, like they just had their best friend tell them the most amazing, action-filled story and that they can see their friend is changed for the better at the end of it all. That’s a tough question, as the older you get the quicker time seems to be! Five years can go by in a blink of an eye, I mean we’re almost on the cusp of Xmas again! I’d like to think that, in 5 years’ time, I’ll have more books under my literary belt and have entertained a great many happy readers in the process. 9. What is the best advice you can give to a new author? Anthologies. They’re out there waiting for you to submit to them. Short stories give you a chance to hone your writing skills and the experience of working with an editor. They also give you a good portfolio of work to show potential publishers when you come to sell that big novel. 10. Where can the readers find more information about you?